Constructed by the great iron bridge builder Thangtong Gyelpo in 1421, it is believed to have been built on the head of the demoness who was causing illness to the inhabitants, to subdue her. The lhakang contains a good collection of Buddhist paintings and iconography. It was restored by the 25th Head Abbot of Bhutan in 1841. Legend says that on the day of the construction, the founder appeared in the form of five vultures and circled the temple. 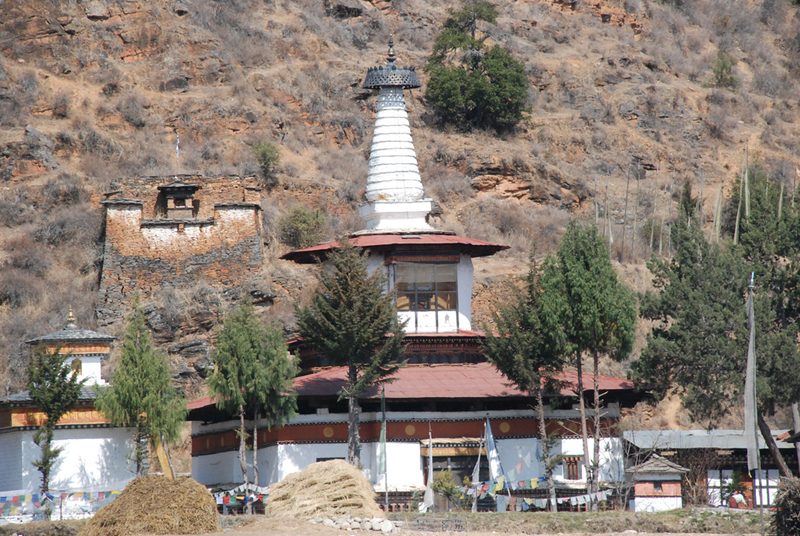 The monastery shaped as a chorten with white tower on top is located across the Paro Chhu, at the edge of a hill between the Paro valley and Dopshari valley, across the bridge from Paro.